The cuisine of Jamaica is almost the definition of fusion. With the golden triangle and spice trade in the early 1800’s, ships filled with foreign ingredients and people from Africa, England, France, India and China rotated through this island stop. 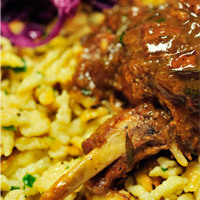 These exotic and different ingredients were combined with their native staples, creating what is today Jamaican Cuisine. This recipe borrows from some of the Indian culture, using curry, coconuts and the local prawns, to make a dish, rich with flavor, spice, sweetness and a touch of Caribbean spice. To balance these flavors, I created a Double IPA rice, that adds some citrus elements (when using a DIPA that has been brewed with cascade, centennial, citra, chinnok, pacific jade and sorachi ace and summit hop varieties) while also leaving behind a touch of bitterness. This is by design, as the technique of cooking rice, isn’t a full reduction, but hydrating the grain. In Indian cuisine, bitterness is often used to offset some of the other strong flavors that the cuisine is known for. This DIPA rice adds a counter point to the slightly sweet curried coconut sauce and will find balance with the sauce poured over it. 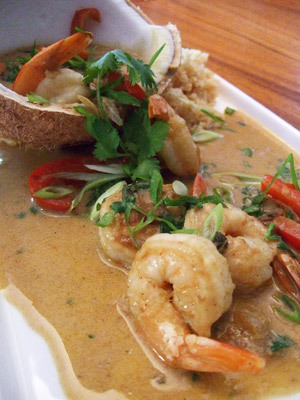 A Jamaican inspired dish, with a Indian fusion of flavors with prawns. To make the rice, first add the raw rice to a bowl and rinse under cold water until the liquid is clear, about five times. Add the drained rice to a medium-size pot with a lid and top with Double IPA, water and a pinch of salt. Bring to a boil on high heat, cooking for 5 minutes. Turn down heat to low, cover with lid and let slowly cook for 20 minutes. Turn off heat and let sit another 5 - 10 minutes. To crack the coconut, place a large bowl in the sink holding the coconut over it to catch the coconut water. Using the back edge of a chef’s knife (not the blade), carefully whack the equator of the shell, rotating the coconut with each hit. Continue until the coconut cracks open. Strain the coconut water of any husk debris and add the prawns. Let marinade for 10 minutes while the sauce is being made. In a large preheated Dutch oven, over medium high heat, add a tablespoon of oil and onion. Cook, stirring frequently for 3 minutes, then add bell pepper. After 3 minutes, add the garlic, ginger and thyme, sautéing for another 30 - 60 seconds. Add theBasic Jamaican Jerk Marinade (depending on how hot you want your curry) and the curry powder, combining with the vegetables. Deglaze with the beer of choice, adding the coconut milk and coconut water (from the prawns). Stir the sauce periodically for 20 minutes, until the liquid has reduced and the sauce has thickened. Place a sauté pan over high heat. Season the drained prawns with salt, pepper and sugar (will help give color and will accentuate the natural sweetness of the shellfish). Add 2 tablespoon of oil to the hot pan, then add the prawns, cooking for 2 minutes (just as they turn from white/gray to a soft pink). 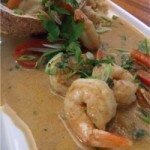 Add the still raw on the inside prawns to the curry sauce to finish cooking/poaching. This will give the prawns more texture in the final dish. Cook the prawns and curry sauce for another 2 minutes. Stir in the orange juice and zest (giving the dish acid) and some of the cilantro. Taste and adjust seasoning with salt and pepper, if needed. To serve family style on a large platter, create a large mound of rice near the center (first fluff rice with a fork to separate the individual grains). Fill the half coconut shells with the Prawn Curry, setting in the rice for support. Ladle the remaining sauce around the edge of the rice. Garnish with scallions and cilantro leaves.